70804 approaches Romsey with 6O31 17:30 Westbury - Eastleigh, 5th October. The light at this time is now becoming challenging. 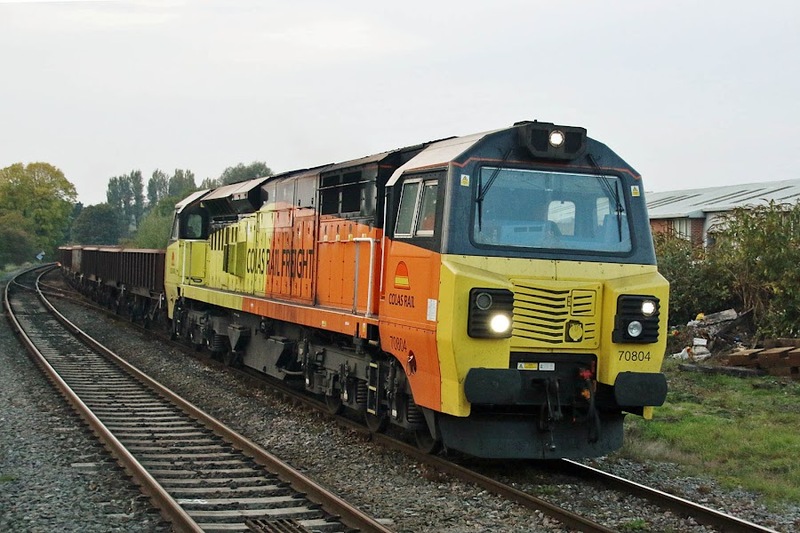 Thursday 4th October: 47812 + 37901 09:38 Eastleigh - Leicester one two three four five six seven; 66516 + 66597 4O40 17:58 East Usk - Bristol - Westbury - Romsey - Eastleigh - Maritime, 66516 4V41 22:40 Maritime - Basingstoke - Reading - East Usk Freightliner HXA wagons - route was not a turning move, may have been a shake down as rakes are re-entering South Wales coal service Cwmbargoed - Aberthaw one two. 66597 appears to have been left at Maritime.